I was an atheist, but also a journalist. So, I used my journalistic training and experience to compartmentalize my investigation. Journalists have to do that with every investigation, every story, so they can be objective and fair in their reporting. Otherwise, how could citizens ever believe anything a reporter reported? It’s not fair for a journalist to allow personal beliefs to affect a professional investigation. I knew that if I was ever going to come to the truth about theism, I needed to put my preconceived beliefs as an atheist to the side while I combed carefully through any evidence that might exist for the existence of God. I took all of the miracles in the Bible and placed them in a special compartment for anything supernatural that I found in the Bible. I had already moved several supernatural accounts from Genesis into that compartment – including creation, Adam and Eve, Noah and the Flood, and many aspects of the stories about Abraham, Isaac, Jacob, and Joseph and his brothers in Egypt. If an atheist is ever going to honestly investigate the truth claims of the Bible, I think they’ll have to do the same thing. I found it necessary to compartmentalize my findings in order to look at all of the evidence without allowing my disbelief in the supernatural to cloud the investigative process. Is that easy for an atheist to do? No, but it becomes easier when the real goal of the investigation is to follow the evidence to a truthful result. If my goal had been only to disprove theism and Christianity, I would not have spent the time I did to dig deeply into the evidence. Atheism was already my worldview and I was effective in opposing deists, theists, Christians and Jews on my radio program. No need to change anything, unless I really wanted to know for sure that God did not exist. Moving all of the “miracle” references to a “supernatural” compartment allowed me to focus most of my time on history and archaeology, which I placed in the “natural” compartment. I will address the supernatural with its miracles later in this series, but my early focus was to see whether there was enough natural evidence to give any support to the truth claims of Judaism and Christianity. I thought about the life Moses’ allegedly lived for 120 years: 40 years as a prince in Egypt, 40 years as a shepherd in Edom, 40 years as a leader of the Hebrews in the wilderness. It seemed that historical information about Moses would probably come from only three sources: Egypt, Edom or Israel. Egypt didn’t write negative historical facts about itself or its enemies. The history of Edom is very thin, except for information found in the Bible and some ancient Egyptian documents. The most vibrant and detailed history is that of the Jews. When an investigator finds a document which has credibility in some or many areas, that opens the possibility other areas in the same document may also have credibility. It’s not proof of accuracy, but it is favorable within an investigation and is placed in the ‘possibility’ category. I didn’t find absolute historical support for the Bible’s story about Moses and Israel leaving Egypt, but I decided to press on in my search. While there are ‘finer’ aspects on the edges of each of these, the four categories will serve an investigator well. What about archaeology? 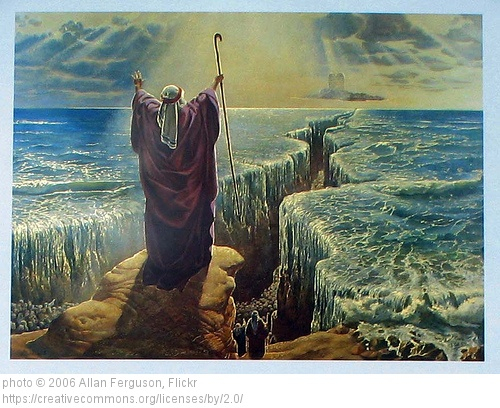 What had archaeologists discovered about Moses? Atheists who know what they’re talking about, especially those who grew up in Jewish or Christian homes, are well aware of the critical views of the Bible’s story of Israel’s ‘exodus’ from Egypt. One of them concerns the Jewish Passover, which many atheists and even some Christians believed came from Canaanite religious practices. Comparing the findings at Ras Shamra that included the discovery of thousands of clay jars with the remains of children sacrificed to the ‘gods,’ along with the sexually wicked behavior of the gods, religious prostitution by men and women and widespread idol worship, to the Hebrew God who commanded sexual purity, love of family, protection of children, and the worship of one God, demonstrates some of the major differences between the religious practices of the Israelites and the Canaanites. Even as an atheist it seemed obvious that the Hebrews did not draw on the Canaanite religions to develop their religious practices that included Passover. In the next part of our investigation, we’ll look at the exodus of Israelites from Egypt in the ‘light’ of archaeology. * Read more about the Ras Shamra Tablets here and here.